Video showing vintage tea sets and memorabilia from the suffrage movement from the author’s collection. A special feature during January and National Hot Tea Month! 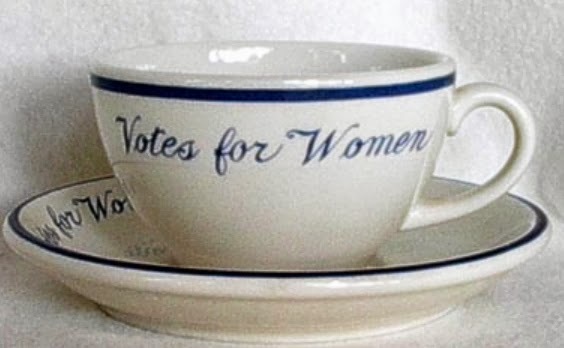 Link to Part I of the story about suffrage tea memorabilia. Did you like this article? That’s the feedback we’ve been getting. Kenneth Florey’s web site. The video photos are from Florey’s suffrage memorabilia collection, items that are highlighted in his book on suffrage memorabilia. What did suffrage activist Edna Kearns do on January 6, 1915. . .100 years ago? An appeal to Meryl Streep: How will the “Suffragette” film from the UK boost awareness of suffrage movement in the U.S.?